Innovative new technology which aims to improve the safety of children boarding school buses is to be trialed in the North East. The "SeeMe Bus Stop" technology, which warns drivers to exercise extreme caution when school buses are in operation, has already proven a success in Sweden. Aberdeen City Council, Aberdeenshire Council and Moray Council are now evaluating options to test the technology. The six month trial is part of a range of measures councils and the Scottish Government are looking at within their devolved competencies as they seek to improve school bus safety. Following meeting with bereaved parents, Transport Minister Stewart Stevenson has been keen to work jointly with the councils to look at what further measures can be taken to improve school bus safety. "The families who have lost children as a result of road accidents have faced unimaginable tragedy. "We don't currently have powers over road safety legislation, but I am determined that we make full use of our devolved responsibilities to ensure action is taken in Scotland. "This is very much a work in progress, but we are considering a wide range of measures to increase the safety of our children, through better education of children and drivers, through to greater visibility. "We are looking at measures to increase the visibility of school children, new education resources, and advanced warning systems which urge drivers to exercise extreme caution. "The SeeMe technology has proven successful in Sweden and looks promising, but we also want to look at what other technology is available elsewhere in the market. This trial will allow us to properly assess its impact. "These measures being outlined today have the potential to improve child safety and as we move forward we want to identify further action which can be taken over the short, medium and long term to make school bus services safer." Councillors Peter Argyle and Richard Stroud emphasised the importance of working closely with the Scottish Government in relation to improving school bus safety. "Daily across Aberdeenshire, over 12,500 pupils travel to school by bus. The safety of these children is paramount and I welcome the opportunity to work closely with the Scottish Government to look at ways to improve this service." "We can address the wider issues of road safety and school transport by working together across services and by continuing to listen to the community. "The council will work with the Scottish Government on pilot projects that will lead to improved standards across Scotland. The recently launched '1 second, 1 life' campaign is a good example of the cross-agency approach that is required." The interactive signs/bus stop flash to warn drivers when schoolchildren carrying a corresponding small transmission device are in the vicinity. 'SeeMe' has already proven successful in Sweden and the technology is fully customisable to different locations and needs. Transport Minister Stewart Stevenson is today appearing in front of the Public Petitions Committee on school bus safety in Fraserburgh. Scottish Government is developing a 10 year road safety Framework for Scotland. Mr Stevenson set up an expert panel which is helping to advise on possible measures as part of this strategy. The Framework will be published in the next few months. The safety of children will be a priority, including on their journey to and from school. Banff & Buchan MSP Stewart Stevenson has welcomed the publication of statistics showing that the level of investment in schools across Aberdeenshire has increased and that the number of teachers employed by the local authority has also gone up. The total gross revenue expenditure for primary, secondary and special education increased by £13,301,000 in Aberdeenshire between 2006/07 and 2007/08. The number of teachers employed also increased by 114 over the same period to take the total to 2, 766. “I am delighted that since the SNP came to power we have seen record levels of investment in our schools, with an additional £150 million invested across Scotland last year. “While some areas have had problems, the majority of local authorities have seen teacher numbers maintained or increased in the face of falling school rolls. Aberdeenshire has seen increased investment and more teachers employed and that can only be a good thing for children in Banff & Buchan. An EU grant of more than £230,000 has been awarded to a special cross border partnership to establish how best to design and build a fleet of small ferries to serve remote communities off the Scottish and Irish coastlines. Caledonian Maritime Assets Ltd (CMAL) has partnered with the Department for Regional Development in the north of Ireland and the Department of Rural, Community and Gaeltacht Affairs in the south to examine a common design and procurement strategy for small ferries which could be used by each of the partners. Funded by the EU’s INTERREG IVA programme, at least eight routes will be examined which covers the West Coast of Scotland and Ireland, including the Ballycastle to Rathlin route in Northern Ireland. This strategy will help reduce overhead costs and increase the potential for efficiency savings through more joined up working across the jurisdictions. Ministers from Ireland, north and south, and Scotland have welcomed the development and the benefits that it will bring to the three partnership areas. Banff & Buchan MSP Stewart Stevenson has welcomed the start of two new schemes to help struggling homeowners remain in their property in the current economic climate. A new Mortgage to Shared Equity scheme involves the Scottish Government taking a financial stake in the home of an owner who is in danger of being made homeless, while an improved Mortgage to Rent scheme helps people facing repossession to stay in their home as tenants of a social landlord. The Scottish Government has put £35 million in place to fund the two schemes over the next two years. “Many households are facing understandable difficulty in keeping up with mortgage repayments as a direct result of the current financial problems. It is important that the Scottish Government is able to provide the support that families need to be able to stay in their homes. “Nobody wants to see hard working families forced out on the streets through no fault of their own, which is why I welcome the fact that the SNP Government is continuing to take action to help people in Banff & Buchan through the current downturn. “The Scottish Government has been consistently out in front when it comes to taking the action necessary to help ordinary people in Banff & Buchan and we are determined to see that continue”. Banff & Buchan MSP Stewart Stevenson has welcomed NFU Scotland’s call for the animal health Holyrood control after a National Audit Office (NAO) report criticised record on financial reporting of animal disease control. The report, by the NAO, condemns the way Defra presents its financial information in respect of animal health issues and also says that financial information from Defra cannot be used to calculate accurate figures for the full costs of managing specific animal diseases. “This latest call for more power to be devolved to Holyrood only serves to underline how poorly Westminster serves Scottish interests. Three reports in 2002 showed that Scotland had handled the foot and mouth outbreak more effectively than Westminster and it is entirely right that Scotland should gain financial control to address such issues. “Scotland has proven its effectiveness at handling animal health and welfare and I welcome these calls for greater financial responsibility to go with existing powers. Banff & Buchan MSP Stewart Stevenson has called for Banff & Buchan skippers to take part in a Scottish Government consultation on the shape of a new days at sea scheme. Under the European Union's new cod recovery plan, member states receive national 'pots' of fishing effort and are free to decide how to allocate days to individual vessels. 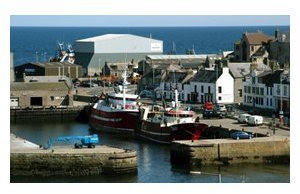 This is a change from previous years, when EU regulations set day limits for each type of fishing vessel. Because of this important change, the Government has agreed with the fishing industry that it is right to consult individual skippers on how the new system should work. “Banff & Buchan’s skippers have an important opportunity to shape the future way in which the days at sea system will operate. Thanks to pioneering innovations across the industry, such as real time closures and use of more selective fishing gear, the level of Cod mortality has fallen and the EU was successfully convinced to drop its plan for a 25% reduction in days at sea. “The efforts of Banff & Buchan’s fishing community have achieved this, thanks to their efforts to build a sustainable, profitable industry and now they have a chance to shape an effective system for future years. “Although the industry continues to face challenges, the responsible leadership it continues to show is what made it possible to avoid a blanket cut in days at sea and instead develop more sophisticated measures with the input of our fishing industry. “I would strongly encourage Banff & Buchan’s skippers to take part in this consultation and make sure that their views are heard in shaping a new scheme that will keep costs for the active industry as low as possible”. 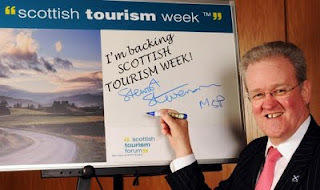 Banff & Buchan MSP Stewart Stevenson has pledged his support for Scottish Tourism week in March. Scottish Tourism Week aims to raise awareness for the important role that tourism plays in Scotland’s economy. “Scottish Tourism Week is an important opportunity for the entire industry to come together and look at ways of increasing the economic opportunities that tourism brings to Scotland. It is important that we all do what we can to support and nurture one of Scotland’s key industries. “Given that this is the year of Homecoming, tourism has a more important role to play than ever before, with significant numbers of people visiting Scotland throughout 2009. “With many important Homecoming events being planned in Banff & Buchan, I am sure that local businesses will see a significant increase in tourist numbers over the course of the year. That is why I am happy to lend my support to Scottish Tourism Week and its objectives”. Banff & Buchan MSP Stewart Stevenson has welcomed the latest publication of police numbers that show record levels of police on Scotland’s streets. 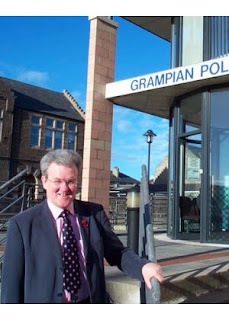 As of December 2008 Grampian Police now has 1,483 FTE officers, up 43 from December 2007 and 109 since the May 2007 elections. Across Scotland, there are an additional 109 police officers since last quarter’s record numbers and an additional 441 since the SNP came to power. “I am delighted that these figures reveal the substantial work that the SNP Government is doing to make the streets of Banff & Buchan safer for ordinary people. “By putting more bobbies on the beat, crime is being driven down across the country as the police become an ever more visible presence. Before the election we promised to put 1, 000 more police officers on Scotland’s streets and these latest figures demonstrate that we are well on the way to achieving this. “I know that residents of Banff & Buchan will welcome this latest progress and the impact it will have on making their communities safer. Where south of the border police numbers are being cut back, the SNP is committed to delivering a safer Scotland through continued increases to police numbers”. A £5 million package of vital improvements to the A76 at Glenairlie will lead to safer and faster journeys for road users in the South West of Scotland, Transport Minister Stewart Stevenson said today. The Minister was speaking during a visit to mark the commissioning of the project. In addition to new safe overtaking opportunities provided for road users following construction of a wide single carriageway over a 3km stretch to the A76 south of Mennock village, part of the existing A76 has been de-trunked and converted into a dedicated cycle track. "This is an important scheme for communities across the South West and we are pleased this upgrade has been completed on time and on budget. "This is a vital package of improvements which will speed up journey times, promote safety and improve connections. "As Minister for Climate Change I am delighted to also see that this investment has also delivered a new dedicated cycle path which will be great for the environment and great for people's health." As part of the work, the 50 mph speed limit at Mennock has been extended, ensuring drivers are obliged to slow down earlier before entering the village from the south. The widened carriageway offers alternating overtaking lanes, providing dedicated overtaking southbound for 800 metres and northbound for 1270 metres, separated by a transition zone prohibiting overtaking for 350 metres. All of the material excavated from the site of the new road during construction was reused during the works and nothing was taken to landfill. Material from existing junctions was used on nearby farm access tracks, while topsoil was reused around the site. In order to improve pollution protection measures in the area, a sustainable drainage system has been installed over the length of the project, ensuring water from the carriageway does not directly run into water courses. Otter tunnels have also been built to allow the animals to safely pass under the road and mammal fencing has been erected to protect animal life. Transport Scotland's Strategic Road Safety Unit will facilitate and oversee a review of speed limits on trunk road routes by 2011. Operating company Amey is currently undertaking this process for all South West area trunk roads, including the A76, and a report will be submitted to Transport Scotland in 2009. Transport Scotland will consider the findings of this report before deciding what, if any, changes to the speed limit on the route are appropriate. A £2.7 million improvement package on the A9 at Carrbridge will help ease congestion and improve safety, Transport Minister Stewart Stevenson said today. This significant maintenance scheme involves the construction of a new northbound overtaking lane, along the Carrbridge stretch of the A9. Work is scheduled to start on 9 March 2009 and is expected to last 12 weeks. "This is an important scheme for the communities, business and tourists who use this stretch of the A9. "Carrbridge was identified as an area where providing overtaking lanes would be of particular benefit in relieving build up of traffic as well as improving safety for drivers. "This project is one of a number of key investments we are taking forward as we invest progressively in the A9 on a continuing basis, leading to a dualling the A9 between Perth and Inverness. Projects such will give a vital boost to the construction industry in Scotland, helping our hard pressed construction workers in this challenging economic climate." This section of trunk road provides a key link to the north of Scotland, carrying around 7,500 vehicles a day. Transport Scotland and Scotland TranServ have worked closely together to minimise the impact on traffic. Traffic management will involve lane restrictions and single file working controlled by traffic lights throughout the 12 week programme. Banff & Buchan MSP Stewart Stevenson has welcomed the publication of the Scottish Government’s framework for tackling the endemic problem of alcohol misuse across Scotland. The Scottish Government is seeking to introduce a minimum price-per-unit to stop strong alcohol being available for pocket money prices; to bring an end to special offers that encourage bulk buying and over-consumption of alcohol; and to put in place powers for local licensing boards to raise the age on off-licence sales to 21 where deemed appropriate. “It is surely not news to anyone that Scotland has a deeply worrying relationship with alcohol, with recent statistics indicating that Scots are the eighth-highest consumers of alcohol in the world. “Alcohol misuse is costing the NHS, police and the courts billions of pounds and clearly something has got to change. Despite what some members of the opposition parties seem to believe, doing nothing is clearly not an option. “I welcome the fact that the Scottish Government is not shying away from these challenges, and has published a radical framework to address these problems. Health and justice professionals have highlighted reducing the easy availability of cut-price alcohol as being vital to addressing the problem, and these proposals will go a long way towards doing that. “In addition to this, by giving local licensing boards the power to increase the age on off-sales to 21 where it is needed, we will see real, locally-led action to combat alcohol fuelled anti-social behaviour in areas that are blighted by these problems. “These are weighty proposals and I am confident that they can make a real difference in tackling the problems caused by alcohol misuse in Scotland”. “Tough action is needed to tackle alcohol misuse in Scotland. BMA Scotland supports this wide-ranging framework which tackles price and availability, and in particular proposes measures to end the deep discounting of alcohol where it is sold for ridiculously cheap prices.